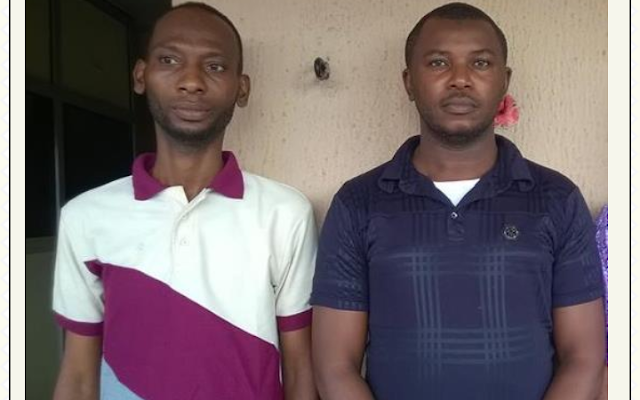 The EFCC on Friday, November 3, 2017 arraigned the duo of Idakwoji Cyril Ameh and Oboma Chisom before Justice Adamu Turaki Mohammed of the Federal High Court sitting in Port Harcourt, Rivers State on a twelve- count charge bordering on conspiracy, forgery, uttering and stealing to the tune of Thirty Six Million, One Hundred and Eighty Six Thousand, Twelve Naira only (N36, 186, 012, 00). We gathered that the defendants pleaded not guilty.In view of their plea, prosecution counsel, N.T Iko prayed the court to grant him a date for the commencement of trial and also prayed that the defendants be remanded in prison custody. In response, counsel to the 1st defendant, Abiye Atorudibo prayed that the court grants him a short date to enable him file an application for bail formally. Counsel to the 2nd defendant, H.D Ibrahim also aligned with Atorudibo. Justice Muhammed adjourned the matter to 22 and 24 November 2017 for arguments on bail and ordered that the defendants be remanded in prison custody. Troubles came for Ameh, a former marketer with Access Bank, when he allegedly connived with his colleague, Chisolm to swindle Jephthah International School, Port Harcourt of Thirty-Six Million, One Hundred and Eighty-Six Thousand, Twelve Naira only (N36, 186, 012, 00) and diverted same for their private uses. They were trapped when the cheques of the school could not be honoured for several days. The matter was reported to the bank to find out what was going on. The bank’s Compliance Officer further brought a complaint to the EFCC. Investigations showed that, at every resumption of the school, Ameh would visit the school and collect school fees paid in cash and cheque by parents, and issued deposit slips to the school. Investigations further showed that he was only lodging the cheques but diverting the cash collected for his personal use. Besides, he was always issuing doctored Statements of Account to the school in a bid to cover up his nefarious actions. The defendant, who was also the Account Officer to Province 4 and Region 5 of the Redeemed Christian Church of God, according to investigation, allegedly forged letterheads of the church and the signature of the pastor in charge of the region in a bid to carry out his criminal activities. It will be recalled that the EFCC recently handed over six bank drafts covering N11.9m to the Redeemed Christian Church of God and another N36m belonging to Jephthah International School stolen by the bankers.